Besides the fact that Super Bowl XLII features two of the NFL most popular franchises in the New York Giants and New England Patriots, it’s also convenient the two fanbases have an unadulterated hatred for each other. Super Bowl XLII is the most expensive event that SeatGeek has ever tracked and we’re thinking the intrigue surrounding a rematch of Super Bowl XLII has a lot to do with it. The Giants upset the Patriots in 2008 while handing them their first loss of the season, ending a pristine streak of 18 games. The two sides met previously in 2011, where a 1-yard touchdown pass from Eli Manning in the final seconds sealed the game at 24-20 for New York. The Patriots haven’t looked back, stringing together 10 straight wins since their meeting with the Giants in Week 9. In case you were wondering, the average ticket price for that showdown was $331, making it the most demanded game involving the Giants this regular season. As it happens, it looks like New Yorkers will have plenty of company in Indy for pre-game tailgating. Just shy of one third of all shoppers on SeatGeek’s Super Bowl event page within the last 72 hours hail from New York and New Jersey, far outpacing the traffic from users in New England. 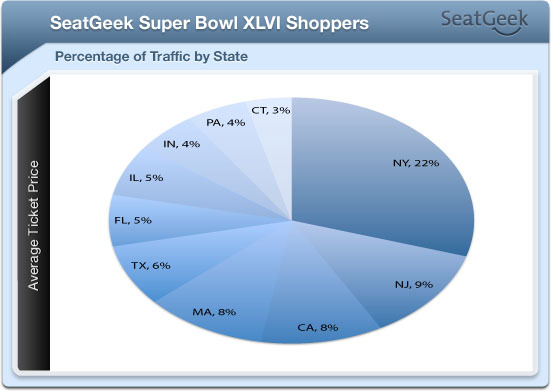 22% of all shoppers to the page came from New York, while 9% came from New Jersey. By comparison, users from Massachusetts account for only 8% of all traffic, and the sum of all users from the six New England states (MA, CT, ME, RI, NH and VT) only adds up to 14.4% total.